June 24, 2010 September 6, 2016 librauesLeave a Comment on BP: Up or Down? Investors Speak! BP: Up or Down? Investors Speak! The explosion of the Deepwater Horizon drilling rig on April 20, 2010 triggered the largest offshore oil spill in U.S. history, claimed 11 lives, and sparked an international crisis with complex environmental, political and economic dimensions. This survey gauged the global financial community’s perceptions of this crisis, its genesis and repercussions. The explosion of the Deepwater Horizon drilling rig on April 20, 2010 triggered the largest offshore oil spill in U.S. history, claimed 11 lives, and sparked an international crisis with complex environmental, political and economic dimensions. Much of this disaster’s media coverage focused on issues of culpability and the intractability of the spill. BP, the British energy giant, emerged as the central culprit in this tragedy, at least according to the prevailing narrative in the media. This survey gauged the global financial community’s perceptions of this crisis, its genesis and repercussions. We conducted an online survey of institutional investors and brokerage analysts. The survey launched on June 11 and closed on June 16, 2010. We received 92 responses: 89 from investors and 3 from sell-side analysts. 74% of the respondents were based in North America, 23% were based in Europe and 3% were based elsewhere. In aggregate, the institutions represented by the respondents own an aggregate of $690 billion of energy-related stocks. Approximately 50% of the institutions are BP holders (source: ThomsonOne data). The author has no relationship with BP, and this survey was not commissioned by any company or organization. Periodically, we conduct surveys to bring added clarity to the dominant issues of the day and to amplify the voice of the institutional investor. Culpability: Respondents overwhelmingly see BP as the primary culprit in this disaster, and a large majority of them (60%) agree that the company has sacrificed standards of safety in pursuit of profit. Respondents urged the company to accept responsibility and not to try to blame contractors. Does the oil spill reflect a lapse of leadership at BP? Respondents disagreed on this question. Thirty percent agreed with the statement that “This is an isolated event, and it does not reflect BP management’s competence. Accidents happen.” However, 42% disagreed with this statement. Although 49% believe that the precipitous decline in BP shares is overdone, several respondents noted that they hold this opinion tentatively, given the intractability of the spill and the uncertainty about the final cost of cleanup and compensation. Forty percent of the respondents were reluctant to speculate about the prospect about BP’s acquisition by another party, and 47% said they did not see this as a likely outcome. In contrast with the criticisms leveled at BP, notably by the Obama Administration, a majority of the respondents believes that it is appropriate for BP to spend money on corporate advertising highlighting the company’s efforts to fix the spill. Stronger expressions of empathy with the people and communities affected by the spill. Bolder defiance of political pressure. Philanthropic investments in the affected communities. Media Coverage: Respondents generally hold unfavorable or agnostic views of the media coverage of this oil spill. Only 16% agreed with the statement that “the media has generally covered this crisis fairly and accurately”. Forty-one percent disagreed with this statement. Forty-three percent provided neutral responses. Negative assessments of media coverage often stem from the perception that the media exaggerates or sensationalizes the impact of events. This was not the case in this survey. Most respondents (69%) either disagreed with the statement that “the media has exaggerated the potential damage from the oil spill” or they withheld judgment on the matter. Regulations: Fifty-four percent of the respondents agreed that “this oil spill demonstrates the need for tighter regulation of energy companies”, with 30% expressing disagreement. In a culture increasingly accustomed to pitting Wall Street against Main Street and profit against the environment, we were heartened to find that the responses to our survey, when considered in their totality, present a balanced view that blends empathy and pragmatism. Respondents conveyed deep empathy for the communities affected by the spill; they voiced outrage at the negligence that, some believe, led to this disaster, and they recognized that BP should or will face financial consequences, whether they come in the form dividend cuts or compensation to victims’ families and the expanding span of affected communities. 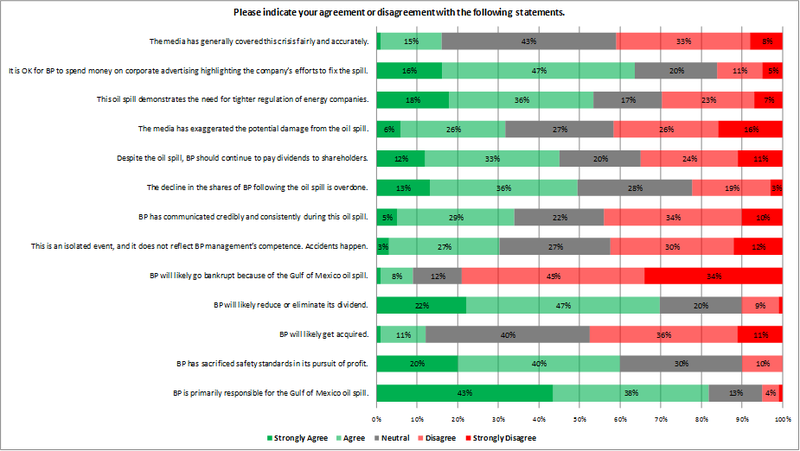 Notably, 54% of the respondents said they would favor tighter regulation of energy companies. At the same time, respondents believe that BP should be guided by the principle of fairness, not by the desire to appease political elites. In fact, they say, BP should stand defiant against groundless claims for compensation and fiery political rhetoric fueled by populist motives rather than the need for justice. Although they overwhelmingly see BP as the primary culprit and believe that the company should accept responsibility, they also believe it is reasonable for others to examine the complicity or responsibility of other parties including Transocean, MMS and the Department of the Interior. Nonetheless, considering the gravity of this crisis, respondents’ view of BP’s future seems optimistic. Many respondents believe that the post-explosion drop in BP shares is overdone, and the prospect of a dividend cut may already be factored into the company’s valuation. One respondent expects that, only a year from now, we may look back at this spill as a distant memory. But, as long oil and gas continue to gush into the Gulf of Mexico, this kind of bold optimism seems premature at best. Next Occupy Wall Street: Rebirth of Authenticity?